The Lost Gardens of Heligan is a world-famous Cornish attraction, yet most people visiting the gardens wouldn't expect felled trees to be part of it - but they are. Heligan is more than just a restored garden, however. The estate recaptures the spirit of a bygone age; an age where estates were self-sufficient and could make both the articles needed to run the property, as well as the furniture in the large house. I was sent by the Editor Colin Eden-Eadon to investigate the new Furniture Maker in Residence Programme at Heligan and was greeted by Andy Giles, Heligan's Wood Project Manager, who showed me around the timberyard at Heligan. Andy has managed to combine Heligan's resources with those of the Centre for the Built Environment at Cornwall College to provide a Student Residency post at The Lost Gardens. The first student chosen was Tom Rosenfeld. The post is partially funded by an EU Social Fund initiative, 'Unlocking Cornish Potential'. After completing four years City & Guilds and HND training at Camborne, Tom was set up in a small workshop at one end of the woodyard complex at Heligan. 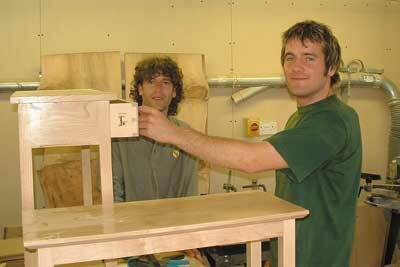 The workshop itself is an example of Heligan's sustainability philosophy. The main posts of the building are Turkey oak, the rear posts and roof joists are larch and douglas fir, and the trees used are from the estate and individually known to the sawyer. Timber in the estate is only cut back or removed for essential maintenance or sound arboriculture reasons. Sustainable woodland management depends upon a certain amount of timber clearance. 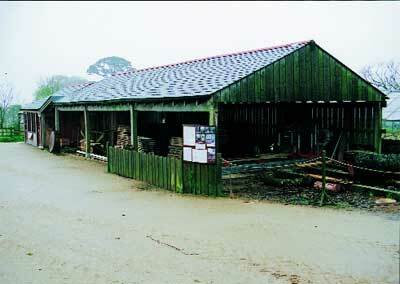 The timber conversion facilities at Heligan are designed to process that wood. They have not been established to maximise timber extraction driven by commercial need, but rather as an estate facility to make the best use of the resources available. Just burning the timber would be both heartbreaking and unsound ecological management. Andy has qualified tree surgeons and large machinery equipped to carefully fell specimen trees, use the timber, and replant with aesthetically and horticulturally appropriate saplings. When the necessary clearance of a single specimen offers the opportunity to acquire a substantial amount of useful timber, Andy assesses how to use every part of that tree. Small branches are processed into chippings for mulch and some of the dead wood is left on site to rot down, which provides a wildlife habitat. 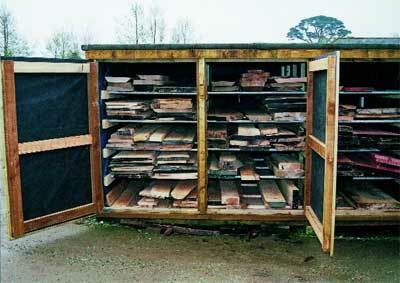 Smaller logs are used for charcoal burning and larger timber is planked, kiln-dried and stored for use or sale. This is a philosophy that could well be copied on other estates throughout the country. Last year, 3000 trees were planted and 6000 trees and shrubs planted in 2003. These plantings are part of a 10-year management plan which will continue to produce benefits many years after the original initiatives began. That is the whole point of sustainable projects! The idea for the Wood Project and Student Residency emerged when Andy Giles wanted to find a use for the timbers that had to be felled, and also to provide a post-training working environment for a local student. Visitors can watch Tom at work from a viewing gallery just a few feet from his bench, and prospective customers can discuss their requirements with him. The timber can be chosen by the customer - perhaps they might even want to choose the log, if they are prepared to wait for conversion and seasoning! Andy has boards for sale both in stick and in conditioning sheds. He has some rather unusual boards as the trees were grown for horticultural reasons, for example Chinese cedar (Toona sinensis), rhododendron (Umbellularia californica) ribbonwood (Plagianthus betulinus) and monkey puzzle (Avaucaria araucana). Don't go there expecting large quantities, however. This is a quality not a quantity operation. In just a matter of few weeks, Tom moved from being a student to a practising craftsman, working on hand-made furniture in front of the many hundreds of people who visit Heligan every week. 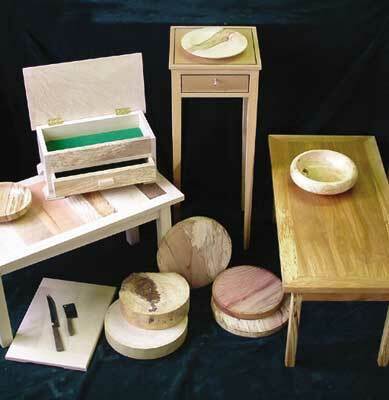 It was hoped that the residency would provide Tom with a chance to gain valuable experience commercially, as well as allowing him to develop his design and craft skills. Phil Whitfield, one of the tutors at Camborne acted as Tom's mentor. "Each student has a unique opportunity to establish him or herself as a designer-maker, with the residency working as a safety net and launch pad rolled into one." Ash and sycamore are almost regarded as weeds on the estate. The result is that Tom had a regular supply of these timbers. The pale colour of sycamore is retained by felling in winter, speedy planking and prompt end-rearing. For a finish, Tom uses acrylic lacquer to maintain the light colour with a final coat of wax. The Heligan shop houses examples of Tom's work, ranging from sideboards to small tables and jewellery boxes. Sample prices for jewellery boxes range from Â£75 and Â£90, coffee tables from £95 to £170 and sideboards/cabinets from Â£350. These also serve as inspiration for commissioned pieces. Tom's stylish designs mean that Heligan can offer a range of quality furniture for sale to its visitors, while encouraging a newly-qualified craftsperson to build a strong career foundation in an extremely competitive working sector. 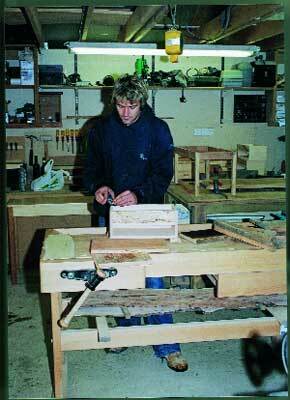 Although Tom worked in a small public workshop he had no space problems. There was always someone to help him lift items, and there is a machine shop at the side of the woodyard which produces both his prepared timber, site joinery and seating benches for the main gardens. All Tom had to do is concentrate on cutting his joints accurately and demonstrate woodwork to his audience while working in the most attractive rural settings. Not a bad job really! Andy's infectious enthusiasm underlies this sustainable project. 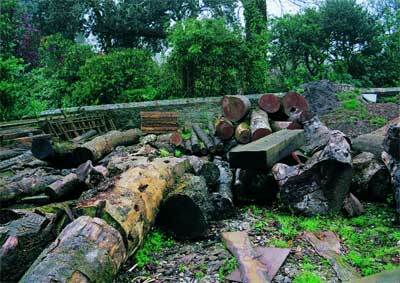 Heligan has space, raw material and trained craftspeople. Andy says: "I'm determined to make this successful." I certainly think he has gone a long way to achieving this. 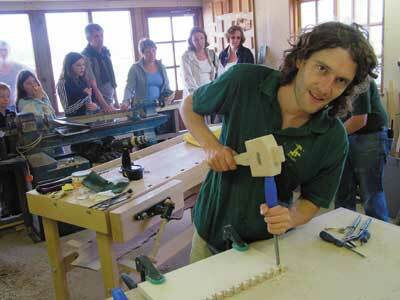 "Heligan has space, raw material and trained craftspeople"